I (Robert) have been using either Steger Mukluks or a combo-system with my Neos for years on the trails. My Neos have been worn for seven thousand miles over the last few winters and it is time for a change. This year I plan on using the Trans-Alaska III Pac Boot. Living in Willow, Alaska it can get pretty cold– usually we are in the mid-20s below zero in the middle of winter and out on the trails it will be much colder. I once measured -36 degrees on the Yentna River a couple years ago and I am sure I have been in much colder. With these boots I plan to replace the liners with a beefier set that many mushers use. When I tried them on and walked around for a while yesterday they were light and comfortable. I typically wear a two sock set up–a moisture wicking material under a Smart-wool type. 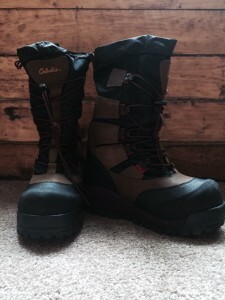 In my Neos my feet often got wet from sweat and made my feet very uncomfortable but the boot system was very light and I could get off the sled and run with no problems. I will amend this review after I wear them for several runs. From the Iditarod trail to the treestand, these boots have proven they are true cold-weather performers. A 13mm Texel® removable liner reflects heat inward to minimize loss. Beneath that, the Moisture Trap footbed wicks away perspiration and condensation. A 1/2″ layer of EVA foam, coupled with the nylon-covered Phylon midsole, puts 3″ of cold-blocking material between your feet and the ground. The tough, flexible vamps are protected by a triple-layer, abrasion-resistant toe guard, and the rubber toe cap ensures longer wear. These boots have a reflective, lightweight waterproof shell with lightweight, reflective nylon shafts. Radiantex™ reflective coating. The 8″ liner allows for pants inside the boots, and the rip-stop nylon gaiter has a cord-locked drawcord to keep out snow. They’re easy to tighten, thanks to a one-pull ball bearing lacing system. Inside, a heat pack pocket allows you to insert toe warmer heat packs. What types of boots do you wear on the trail?